Our 65th birthdays and 40th wedding anniversary just happened to fall within a year of each other. Because of that, we decided to take a look at our Bucket List, and that’s when traveling to Africa became a realistic dream for us. 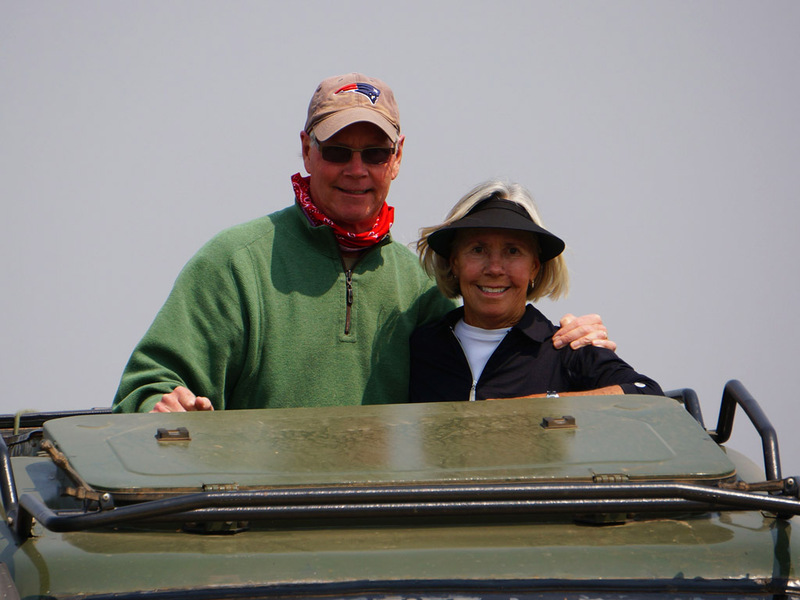 An acquaintance of ours recommended Africa Dream Safari, and from the very first contact with Dawn Anderson and the website, we realized we were on our way to a private, luxury safari in Tanzania for four. As luck would have it, our relatives Tom and Danni, would be sharing the trip with us. The planning process ended up taking two years. Knowing we wanted February, which is a popular time, many of our desired accommodations had already been booked. Once we decided to take our time, everything fell into place perfectly. We arrived in Kilimanjaro, and were met by Mathius and Timan, our ADS greeters. Our entrance, transport, and briefing was handled by them, which made the process very smooth and entirely stress free. Our ride to Arusha was informative, and Mathius presented all of us with gifts made locally in Tanzania. The Mount Meru Resort was lovely, and our three nights there gave us time to adjust, rest, and settle into the ambiance of Tanzania. Our first and second days there were planned through ADS; a visit to the Tanzanite Factory Experience, The Cultural Center, and The Arusha National Park. Our greeters were with us the first day, and even stopped to purchase us some local fresh roasted corn to try. It was most unusual, and we decided it resembled a combination of boiled corn on the cob and popcorn. Thompson was our guide the second day. He provided an excellent tour of the park while finding many species of animals and birds, and a beautiful, restful overlook for our lunch. It served as an exemplary introduction to our safari. ADS planned one short flight from Arusha to Seranera in the Serengeti National Park, where we met our guide Francis, and we were then his passengers for the next ten days. Upon realizing the vastness of the Serengeti, there were some metaphoric comparisons we made between the ocean and the plains. It was as if we were on a boat, bumping along, the dust being our wake, the horizon in the distance encircling us. Our sightings were numerous, and consistently different, yet singly paramount. Lionesses with cubs, lions and lionesses in new relationships, cheetahs with cubs, a cheetah killing a gazelle, and elephant and giraffe families all occurred daily. Herds of roaming buffalo always precipitated another verse of “Home on the Range.” Hippos meandering at a close proximity, while verbally and physically playing in the water all day long, was surely always entertaining and amazing. At the Ngorongora Crater, it was very different from the Serengeti. After descending into the crater, we spotted many of the same animals in small numbers, comparatively. It was a true melting pot where the animals and birds lived for life, protected. We found it a wonder there weren’t more there. The wildlife was phenomenal throughout the trip, and we ended up locating over 80 species of birds. We had purchased the book, Wildlife of East Africa, a suggestion from ADS, which provided us with pictures, descriptions, and an accounting of what we came upon. The zebra and wildebeest migrations added an intense and overwhelming magic to our safari, and is truly impossible to articulate. The Serengeti could absolutely be the 8th Wonder of the World. Fortunately, we experienced many of them, and all were unique in their own way. It was the birthing time for both species, and there were abundant babies around. Many wildebeest’s births took place, and we witnessed the natural beauty of them. Gazelle’s, both Grant’s and Thompson’s, jumped and scooted everywhere along with warthogs, and hyaenas, and ostrich. Both rhinos and leopards were spotted, but in lesser numbers. Regardless of where we were, at any given time, we were surrounded by peacefulness, and quiet, unless the animals were communicating. The Four Seasons Lodge, Lake Masek, Kusini, and Lemala were where we stayed during the progression of our safari. They were all different, and inviting in their own ways. Ensuite, private bathrooms, and hot and cold running water were priorities for us, and ADS made it happen. Francis made our safari the trip of a lifetime. His gentle nature, humor, and knowledge were consistent throughout. He often found sightings and alerted other guides via 2-way radio. He allowed us to “check the tires,” as often as necessary, kept our box lunches safe and sound, provided snacks, drinks, wipes, and all the comforts we needed daily. Our Land Cruiser was very comfortable and had binoculars for each passenger. The cruiser seated 8, and only having 5 gave us plenty of room to move around, pop through the roof, and view without feeling crowded. Francis joined us for some dinners, during which we learned more about life in Tanzania. He shared some of his personal and fascinating life with us, including much of his country’s history, and the politics of it all. The people of Tanzania are generally very congenial and accepting of their lives. With Francis’ guidance, we came to realize and understand that the animals rule the Serengeti, and are respected by all. Survival of the fittest is exemplified, and the eco-system is balanced. The safari goers are in the zoo cruiser, while the wildlife roam freely in their territory. Poachers remain a threat, but the government appears to be putting more in place to control them. We bid farewell to Francis reluctantly, and returned to Arusha and Mount Meru Resort for a couple of days before departing. It provided a well embraced debriefing for us to absorb where we had been and what we had seen. Our safari was remarkable in every way, and in so many additional ways that are too innumerable to mention. It far exceeded our wishes, dreams, and hopes, and the memories will be with us forever. Viewing Kilimanjaro as we departed was a sight, glowing through the clouds that gave us yet another chill. Thank you to ADS, Dawn, Cathy King, and Francis, for a dream that came true. Previous PostPrevious Post Our Trip Went Like Clockwork.